Can we talk about Harry Potter? The Harry Potter fandom has really jumped back into action lately, hasn’t it? It’s not like it was ever really dead, but with the new play, book, AND movie coming out the whole Harry Potter universe has gotten a bit of a revival. Who else is getting really excited about all the buzz going on? You know, I like that they decided to make a play rather than “just” a book or movie. The Potterverse now nicely covers pretty much all forms of entertainment. Also, a theatre play sounds classy, doesn’t it? From what I’ve seen on the website, my general opinion is that everything looks great. The cast seem spot on, Paul Thornley especially look exactly how I would imagine a grown-up Ron to look like! Damn, I wish I could go to London to see the play… I will get the book version as soon as possible, though! Are any of you going to see the play live? 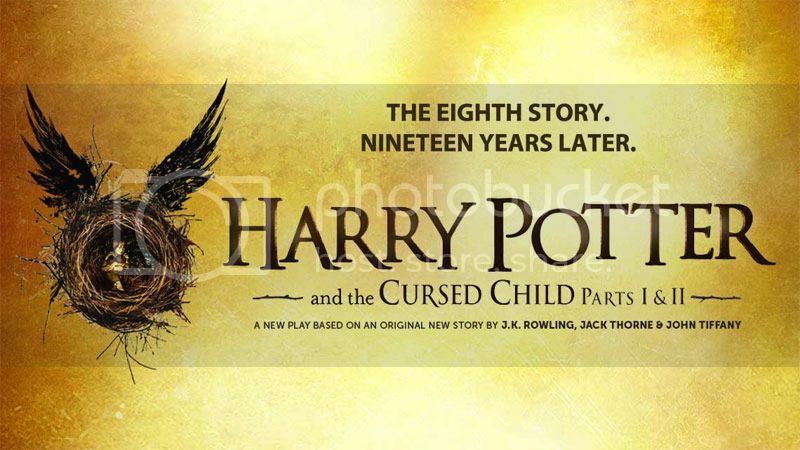 Have you read the new writing by J.K. Rowling? I would’ve expected a North American school of witchcraft and wizardry to be much more based on Native American magic/mythology/culture etc. That was a bit disappointing, but the story was still fun to read. When the old Pottermore sorted me into Slytherin I had a bit of an identity crisis. Last year I had to retake the test when the new Pottermore came out, and this time I was sorted into Ravenclaw. Guess that’s the final verdict. To be honest, Slytherin has grown on me and I feel like I’m still at least part Slytherin now. A Slytherclaw if you will. Ilvermorny has four houses, just like at Hogwarts, and there’s even a sorting test on Pottermore. When I took the test I was sorted into Thunderbird. Being Scandinavian, if I were to attend a magical school I would probably have ended up at Durmstrang. It has been named the “North European” school, and even though the location is hidden it is most likely somewhere in Scandinavia, the Baltic states, or north-west Russia. Any of those locations would be closer to me than Hogwarts or Beauxbatons, so it would make the most sense to go there. This is one of the most anticipated movies of the year for me! The trailer is making me wish it was November already, I can’t wait to watch it! It looks to be made in the same style as the Harry Potter movies, which were absolutely beautiful, so my expectations are high. In case you haven’t heard of this before; I just want to share this cool short film made by a group of fans. It revolves around an encounter between, well, Snape and the Marauders. The film is set in 1978, just as they have all graduated from Hogwarts. SSATM started as a project on Kickstarter and was finished in March this year. You can watch it for free on Youtube, and if you haven’t yet I think you should. I found the film really well made, with decent effects and nice actors. Oh we can ALWAYS talk about Harry Potter! LOL I wish I could go and see the new play, I think it would be pretty amazing. And also very excited for the movie. I sure hope I can see it before new baby comes because I have no idea when I can do it after!! I will also have to look at the short you suggested. I had never heard of it. I am always going to be a fan of Team Starkid’s A Very Potter Musical which can be found on YouTube as well! I’m back into Harry Potter thanks to Fantastic Beasts and Where to Find Them. I cannot wait for the movie to come out. It looks amazing! I cannot decide how I feel about the new play into book form. I don’t know. It really does! I’m getting pretty excited about it. :) I can’t wait to see it. There are so many really amazing characters in the Harry Potter world! On my list of favourite HP characters, Harry Potter himself is pretty far down the list tbh. Newt Scamander seems really interesting though, I’m looking forward to getting to know him. I’ve been dying to watch that fan film as I’ve heard so many good things about it, but I’ve yet to make the time! And for some reason, I didn’t preorder a copy of Harry Potter and the Cursed Child so I’ll need to get my hands on a copy at some point! I didn’t preorder Harry Potter and the Cursed Child either… and they seem to be selling really fast. Most stores around me have sold out their copies. I’m so glad Harry Potter is everywhere right now! It’s wonderful, but I have to admit that I also miss the nostalgia of growing up with the books. With all the new stuff coming out, it kind of feels like seeing childhood friends again but trying to get used to them as adults. It’s good but different. I’m a Slytherclaw! I definitely consider myself a mix of those two houses. On Pottermore, I’m a Ravenclaw and a Wampus. I had never heard of Severus Snape and the Marauders, but I’ll definitely be checking it out! I know what you mean, it’s a bit weird. Still nice though, I love seeing Harry Potter everywhere! Looking forward to seeing fun new merchandise coming out too. Unfortunately missed out on both the first and second lot of tickets for the play, they’re selling very very fast when they go up on sale. I’m looking forward to seeing it eventually but don’t want to read the book before I’ve seen the play but really, really want to know the story! So torn lol. I’ll definitely be seeing Fantastic Beasts and where to find them when it’s released later on this year though. I’m not sure why but I haven’t sorted myself on Pottermore yet! … In case I don’t like the house they chose for me. Unofficial tests online tend to put me in Ravenclaw or Gryffindor!